The 2012 International Esri User Conference is happening soon in San Diego, California. Prior to the user conference is the Survey Summit and ACSM Annual Conference, co-hosted with NSPS and ACSM. On Sunday morning, July 22nd, from 10 AM to 11:30 AM in Room 30A, TractBuilder will be holding an in-depth walkthrough of their Drafting Tools for ArcGIS. During this time attendees will not only learn what the Metes & Bounds, Quartering, Auto-Quartering, Well Spotting, and GridMaker Tools are capable of but will also get to see their full workflows and examine exactly how they will fit into their own organizations. Originally arranged for the US Army Corps of Engineers, the walkthrough has now been opened to anyone. 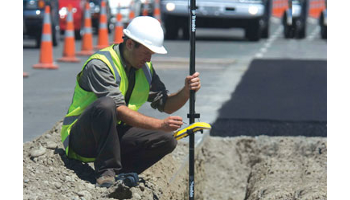 Many TractBuilder users are engineering companies, surveyors, energy sector GIS specialists, and service companies. If you or your organization is responsible for mapping features based on legal description this walkthrough will be very informative and useful.For those unable to make it to the walkthrough you can view the presentation live on YouTube or on Google+. Esri, the Esri globe logo, GIS by Esri, esri.com, and @esri.com are trademarks, service marks, or registered marks of Esri in the United States, the European Community, or certain other jurisdictions. Other companies and products or services mentioned herein may be trademarks, service marks, or registered marks of their respective mark owners.